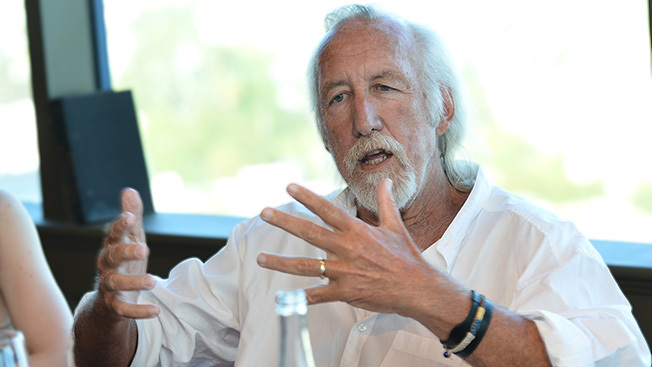 Lee Clow was in Cannes this year to collect this year’s Lion of St. Mark award and to chat with fellow ad legend George Lois. His agency picked up a Grand Prix in the print category for its iPad mini work. Adweek sat down with Clow, the chairman of TBWA\Media Arts Lab and global director of Media Arts for TBWA\Worldwide, to discuss his career, his views on a changing industry and when he might actually, completely, retire. How has your role at TBWA changed over the past few years? Well, I've been there all of my adult life. I started as an art director, and I'm kind of ending up as an art director. During the course of my years, I've creative directed, I've led, I've chairmanned. We got big. Now, these days, it's the most fun to just get back to doing some work. Trying to make it elegant and smart. Trying to stay out of the business complexities. Have you identified a successor yet? We're so big now, there's a bunch of young people that are leading different things. John Norman, who just came in to lead L.A., is a great talent. We're hoping L.A. continues to kind of be the epicenter of our creative energy because everyone kind of fuels off of that. So he's got that kind of front-line role. Even when I was global creative director, worldwide creative director, I think that job is as simple as “Do great work on the brands we have in L.A.” That will set the standard for the networks. What did Jay Chiat teach you about being persuasive? Jay Chiat encouraged me to be brave. Encouraged me to push. He was never satisfied with OK or ordinary. He was always expecting that the people he wanted to lead his agency were the ones that were pushing the hardest to do the bravest stuff. As you get bigger, that's one of the hardest things to do—to stay incredibly brave and keep doing daring stuff. In a noisy world, what's the importance of visuals? What's the right balance of art and copy? That's what everybody is groping around trying to figure out. Everybody, I think, starting with clients, are very confused about all the new media and its role and relationship to old media, and how to use each medium appropriately. Some clients are very confused and think that new media, digital media should replace old media. That's really usually wrong. Because it's not an art form yet, it's still fairly primitive in terms of storytelling compared to some of the older, more traditional, forms. I happen to think digital is still technology, and it's not the art of storytelling and brand building and messaging yet. It's a piece of it, it's a tool. John Hegarty retired last year, after collecting the Lion of St. Mark in 2011. When do you expect to follow him? I'm going to only do the stuff I want to do, as long as I want to do it. The thing about retiring in total is I still love coming in and hanging out with young smart people and working on ideas. If I can avoid all the stuff I don't like, I can just do that. The alternative is not coming to work anymore and hanging out with people my age, which doesn't sound near as appealing as hanging out with these cool young smart people that work in our company.